Sid passed away quietly on 22/8/2009. 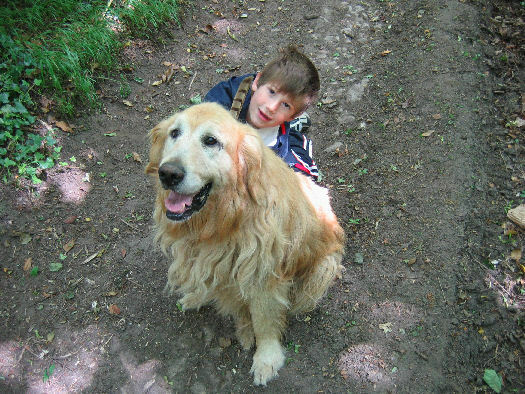 He lived a long and happy life for a Golden Retriever. He had slowed down considerably in the last couple of years, becoming quite deaf and having problems with his back legs. He will be hugely missed as he has been a great friend and family member to us for so long. We love you Sid and will miss you hugely. Sleep well old friend. Sid is a big, smelly 15 year old Golden Retriever. He is very kind hearted and wouldn't harm a fly. Sid's hobbies include lying in water, sniffing stuff (best not say what), sleeping, barking at anything, playing tug-o-war with his rope and most of all, going for walks! For the last couple of years he's suffered from bad skin (like many older Golden Retievers) and has to be shampooed regularly. He periodically needs antibiotics and steroids if it gets bad. He goes to the groomers every few weeks which helps a lot. He doesn't come out with us all the time any more, but still loves a good walk now and then. He's got several wierd traits like being afraid of (drinking) glasses and party hats, not eating his food while you watch him and lying in puddles. Sid is never happier than when he's in water. It took him a couple of years to figure out that he could swim, but he's always loved lying in water; even a puddle will do. He used to go bobbing for stones that we threw in the stream on his regular walk in Wokingham and always came up with the right one despite there being hundreds to chose from. Sid likes the forest. Actually he likes anywhere he can sniff, get into water and... well that's pretty much it really. We used to walk over to Redbrook most weekends before we discovered Geocaching. We still love the walk, but don't go as often now as we have so many other places to go. Anyway, having a pint at The Boat Inn and then tackling those hill was no joke. My legs go all wobbly. Will's got this thing about taking home feathers. Don't ask me why. This was taken on another regular walk past Will's tractor. The cache for Tractor Hill now lies yards from this location. Sid doing his impersonation of the Devil Dog on one of our regular walks around Penallt. 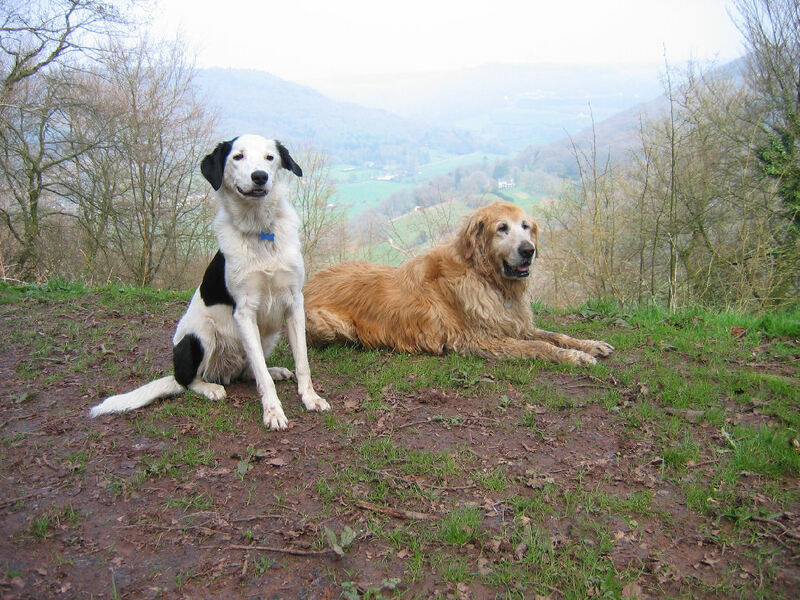 We usually stop at the Boat Inn for a drink, which also gives Sid a chance to get in the River Wye for a swim or just a paddle if he's too tired. Either way, were all happy. Yep, that was a pretty big hill. Take a rest boy. Sid strikes the perfect pose near Newland Quarry. He's a pretty versatile dog. He also like camping. Here he is in Aberporth on his first expedition. At the Somerset Arms on the way back from Aberporth. We like this pub. It's not pretentious, the gardens are really nice and there's a great wooden climbing frame and often a bouncy castle too. So that's me sorted. Sid's in the Wye again - what a surprise. Here he's enjoying his last few days before the bomb drops. Boom! Make way for the new boss. Sid's had 12 years of being top dog (except for the cats) and now the young pretender is on the scene. Still, at least we won't have to pull that smelly old rope any more. Sid's got a spring in his step now that he's got a new best mate and he has to start running for that ball now there's competition. Actually, there's no competition at all. Bob's twice as fast as Sid ever was, but he enjoys it. And then came Geocaching... An A4 sized cropped copy of this photo takes pride of place in out living room. This was taken at The Hermit and the Waterfall overlooking the Wye Valley and ended up being the basis for our calling card.